How to motivate developers to grow?! But not everybody is attracted by these stuff. There are some people that thing it is not possible to earn them so they do not even try... Hey don't think like that! You cannot have only senior and highly motivated people in the company! And for sure you cannot let someone leave because of this!!! Unified C# 3.0 Specification Now Available. In this document (above 500 printed pages) you can find every C# feature and some examples. It can be called also "Ultimate C# Tutorial". This document combines the 1.1 version of the spec, the 2.0 version, and various other bits and pieces into one large document some 500 pages in length. Here you will find the definitive technical description of the C# language in the words of the engineers who created it. It is the single most authoritative reference for the C# language. Though not called out by name in this document, many of the people who created the C# language contributed to it, and they are its primary authors. I am proud to announce that the Tutorial for C# 3.0 and LINQ in Bulgarian is done. There is no more links to StayTuned page (at least it is not supposed to). I hope my bulgarian colleagues will find it interesting and useful. And the cherry of the cake - I included PDF file for download - you can find the link on the bottom of left menu on the tutorial. If you can write all your ad-hoc queries in LINQ, you have a big head-start over everyone else in C# 3.0, LINQ and LINQ to SQL. (Further, LINQPad gives you a knowledge of LINQ that does not depend on Intellisense, and so will not fall to pieces at job interviews!) And continued use of LINQPad will keep your LINQ knowledge alive—if you're not lucky enough to be using LINQ in your current projects. Last week I was able to finish the biggest branch of LINQ Tutorial - LINQ to SQL, and most common LINQ to Objects. I have raw version of LINQ to Entities and LINQ to DataSet and I need a couple days to finish them. So I am on final curve - I have to wrap up LINQ to XML and it's subset LINQ to XSD - My hopes are to finish it 'till the end of the week. ScottGu announced VS 2005 HotFix Patch that speed up debugging ASP.NET related projects in VS 2005. You can read more about it in this KB article here. The particular bug fixed in this hotfix was surprisingly difficult to track down. The slowdown issue occurred when breakpoints were set in multiple source files in the same project that had the same short file names (for example: two default.aspx.cs files) and which were organized in a certain directory structure pattern on disk. The patch fixes this issue and should prevent the debugger from pausing when trying to load the web project's assembly symbols in this case. What you can build with .NET 3.5 and Silverlight? With the upcoming Visual Studio 2008 and new C# and VB syntax the abbreviature LINQ is already wide spread. With LINQ are mentioned a few branches- LINQ to SQL (the most popular one), LINQ to Objects, LINQ to XML. "LINQ to Objects allows .NET developers to write “queries” over collections of objects. Out of the box there is a large set of query operators that provide a similar depth of functionality to what we expect from any SQL language working with a relational database, and if what we need isn’t present out-of-the-box, we can add our own." Sounds good, isn't it? But the question arises: By having collection of objects (similar to tables) and language that allow writing queries (similar to SQL) is is there a way to speed up processing (similar to indexes)? Codeplex project - as it is not MS project (at least not closed one). I think this is interesting and there is a future for it but in low market segment. I know there is such thing as Object Database and this sounds like one. In the posts I read it seems that MS won't put effort on something that would compete SQL Server 2005 Express if it grows enough. They'll rather improve SQL Server to support mapping and with this they'll achieve part if the goal while having SQL Server in the shape we know it. This is not in far future. 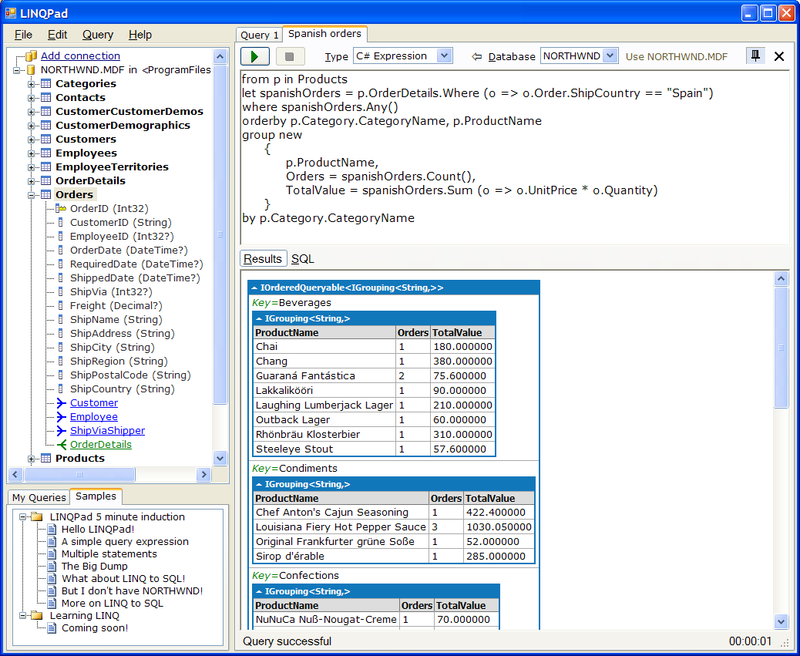 It is already known that MS SQL Server 2008 will have Entity Framework built in. Here is nice list of article that every blogger should read if they wants his blog to get attention in the web space. Note that it is dugg over 1000 times. A great software developer and architect from Pakistan Omar Al Zabir wrote an article about disasters for production web sites and their solutions. It is very interesting as it describes how to deal with problems (and event worse - disasters) in production.